Being prepared is an ideal we take with us everywhere. 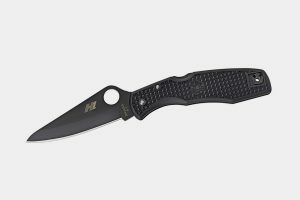 At home or abroad, from campsite duties to fighting off an attacker, a high-quality tactical knife is a steadfast piece of kit that shouldn’t be ignored. Above a tactical pen or tactical flashlight, the best tactical knives sit in your armory alongside a firearm as a close-quarter self-defense weapon. With the widest definition of any knife, tactical knives should be capable of going behind enemy lines, act as a weapon, defend against assailants and remain capable of being turned into a multi-tool. A high-quality tactical blade is the workhorse of the knife world built for abuse, taken with gritted teeth into the eye of the storm where any other knives are just seen as silverware. In a world full of brands mocking the term “tactical knives,” we’ve searched high and low for the experts who honor and stick to the code. Embodying the tradition of a tool that works in the field, and isn’t just finished with a fancy paint job. We’ve summarized our in-depth reviews with a quick look comparison grid of each tactical knife to help you find the right blade for your budget. We sought tactical knives that are capable of hacking through paracord, surviving in a jungle, and for defense in a fight. Our list of the best tactical knives are designed for comfort, all-weather ruggedness, and survival. Whichever tactical knife you choose you’ll always be mission ready. Starting off our list of, the best tactical knives is, the Smith and Wesson Border Guard 2 Rescue Knife. The majority of the knives appearing on this list are designed for a particular role, whether that’s for self-defense, combat or survival. The Border Guard 2 is 100% tactical. Serving many purposes the handle has a built-in safety belt cutter and a glass breaking pommel that can be used without opening the blade – ideal for emergency situations or use by first responders. Made from 440C stainless steel the 4.4-inch ComboEdge Tanto blade is split with a sharp and serrated edge that will cut through rope and wood while the tanto tip boasts a saber grind; great as a self-defense weapon. The liner lock keeps the blade securely housed in the frame, and the aluminum clip will keep the Border Guard 2 sat low in your pocket for a discreet carry. At a such a reasonable price this is an extremely capable EDC budget knife. If this knife doesn’t deter an attacker, then we’re not sure what blade would. 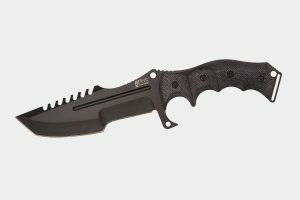 One of the most aggressive looking tactical knives featured, the MX-8055 Fixed Blade Tactical Knife measures 11-inches long, with a six-inch, 5mm wide blade with one role in mind; fighting. The G-10 fiberglass laminate scales feature deep grooves, a pistol grip, and jimping on the back to keep the knife secure in your grip, even when it hits hard bone. And there are four screws each side so the entire blade can be kept clean or if you decide to change up the grip. Made from high-quality 44 black stainless steel, the MX-8054 weighs 13-ounces which is a little heavy but will certainly help to inflict maximum damage thanks to the aggressive tanto end. Not just for combat there are featured holes near the balance points so that the knife can be strapped to a stick or pole to be used as a spear for hunting or fishing. For a lightweight tactical knife, the Gerber GDC Tech Skin Pocket Knife is the perfect everyday carry. Small and lightweight, the GDC Tech Skin is just 3.4-inches when closed and will easily fit your pocket along with the rest of your gear. Designed for lightweight cutting tasks the 2.5-inch stainless steel drop point blade folds into a rubberized handle that provides a secure grip. With no exposed metal when closed the Tech Skin Pocket Knife eliminates scratches to your phone or other valuables. And if you’re looking for a quick one-handed opening knife, the GDC comes with dual integrated thumb studs with a lock back safety feature. 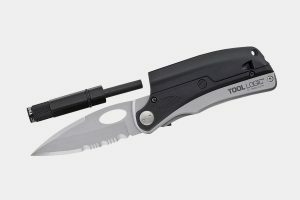 Tactical knives aren’t usually considered as a multi-tool. They’re designed for a primary role, to cut, attack, defend or shear. But if you ever found yourself lost in the woods or stuck on a rocky outcrop then, the SL Pro 2 Tactical Knife would be a welcome addition to your gear. 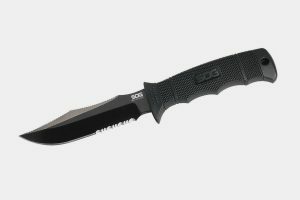 SOG have created a blade that works as a great knife but one that boasts a few added extras. The SL Pro 2 comes with a built-in LED flashlight and an integrated emergency whistle for when you’re lost at sea or buried in an avalanche as well as a 3-inch partially serrated blade. And when the night draws in you’ll find a magnesium alloy fire rod inside the detachable flashlight housing that can produce a shower of sparks at over 2500 degrees Fahrenheit to get any fire going. At just 1.6-ounces this is a tactical knife you can’t afford to leave at home when embarking on your next expedition. Part of SOG’s SEAL series lineup, the Seal Pup Elite is designed for use by the U.S. special forces; when a high-performance blade is necessary. That doesn’t mean it’s reserved for the elite of the elite; it can perform just as well on your next trip into the wilderness. With a black TiNi finish the thick, 5-inch AUS-8 steel blade will cut harder and stay sharper for longer. With an added rasp to the blade’s spine, you’ll be able to carry out smaller, more intricate cutting tasks without your thumb slipping and the glass-reinforced handle also offers plenty of grip, with or without gloves. 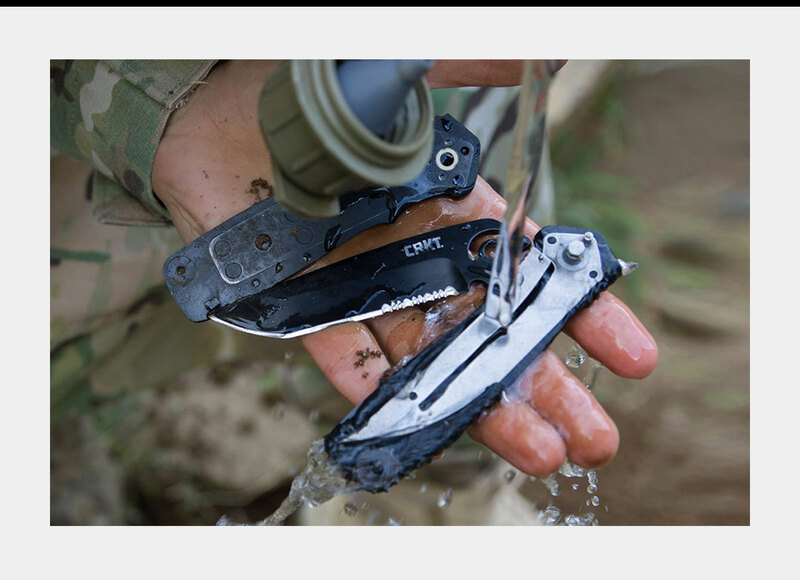 And just to ensure the knife could perform to military standards, SOG immersed the Seal Pup in salt water during testing for two weeks, without it corroding. Designed for a combat role the M48 Cyclone’s eight-inch blade is made from a 2Cr13 stainless steel featuring a unique spiral design. At the tip of this unusual knife is an incredibly sharp piercing point that leaves little to the imagination of what it should be used for. And on the opposite end, the base of the handle has a stainless steel “skull crusher” pommel. 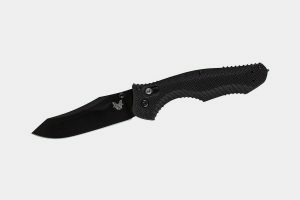 At over 13.5-inches long, this isn’t your standard tactical knife, but the fiberglass and reinforced nylon handle give outstanding grip, so there’s no worry about being able to handle such a weapon. With so many sharp points, the M48 comes with a specially designed TPR and Nylon belt sheath to keep you away from any sharp ends. With decades of experience, Kershaw sure knows how to create some of the best tactical knives on the market. Since 1974 they’ve been perfecting their craft of EDC knives and this USA made model, the Black Blur Glassbreaker is built to withstand any abuse you can throw at it. Extremely functional, the Blur boasts a Sandvik-crafted, partially serrated recurve blade, a carbide tipped glass breaker and aircraft grade anodized aluminum handle with Trac-Tec grip-tape inserts for a solid grip. The SpeedSafe assisted opening mechanism ensures one-handed opening and weighing just four ounces; the Blur is the perfect tactical choice for your everyday carry. 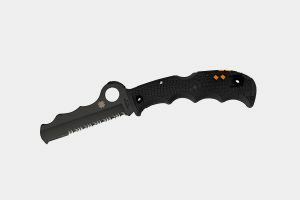 Spyderco tactical knives are defined by their signature leaf-shaped blades and Spyder thumb holes. They’re designed for those who like to stand out. Delivering some of the best pocket folders, the Spyderco Pacific Salt Black Blade Knife will meet your tactical objectives on land or sea. Coated in black carbonitride, the plain edged H1 steel blade is protected against rust and pitting even with saltwater use. 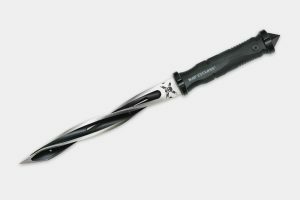 This level of protection is extended to the internal steel parts housed in the textured black fiberglass handles, and the large blade hole is made for easy one-handed opening. A reversible titanium clip will keep the blade secure in your pocket, and a lanyard hole also gives you the option for a neck carry. If the GDC Tech Skin is the perfect mini tactical knife, then the Propel AO is the ideal everyday carry for field personnel. Designed for the tactical demands of the world’s military the AO is just at home with seasoned law enforcement officers. 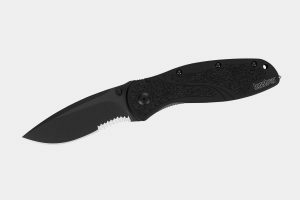 With a slim profile the G-10 composite handle is perfectly balanced and houses a 3.5-inch 420 high-carbon steel, black oxide coated lockable blade. 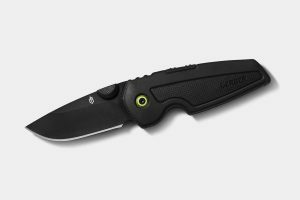 Gerber’s Assisted Opening 2.0 design delivers smooth, one-handed blade deployment and can be engaged at only 45 degrees. An adjustable, three-position pocket clip allows customizable stowage while a lanyard hole adds utility. Cold Steel’s Recon 1 line of tactical knives are setting a standard that’s hard to beat in the knife industry. They’re designed to be as tough as nails and will cut like a chain saw. Available with two, three, four and five-inch blades, every aspect of their construction has been over engineered to make them as reliable, durable and efficient as possible. 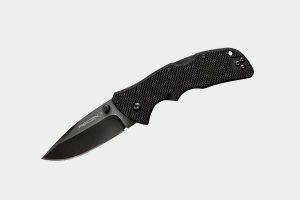 The Recon 1 Mini Clip Point features a three-inch blade made from imported Japanese AUS 8A stainless steel that undergoes heat treatment and sub-zero quenching for a level of toughness unmatched at this price point. The G-10 laminate scales are contoured for a non-slip grip and protects Cold Steel’s world-renowned Tri-Ad back locking system. This set-up means you can always depend on the blade to stay securely open, even in the most arresting situations. 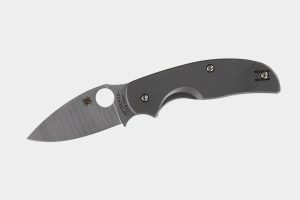 Spyderco knives are generally designed for combat and self-defense. The Spyderco Assist Black Blade is made for utility, prepared for high-pressure situations. Unlike other tactical knives, the Assist features an unbreakable blunt tip that won’t stab anyone unless under serious force. It’s the ideal carry for first responders or submarine commandos working in a tight spot when that’s the last thing you want to be doing. The toothed blade is made from a VG-10 material that easily slices through seat belts or rope by simply squeezing the handle and blade together in your hand. And for when you’re in a confined space, the Assist also boasts a Cobra Hood grip that helps guide your fingers for a rapid deployment. Add a retractable carbide tip for breaking glass, and a survival whistle and you have a tactical knife made for saving lives. The SOG-TAC series of tactical knives are designed as go-to tools for law enforcement and military personnel. 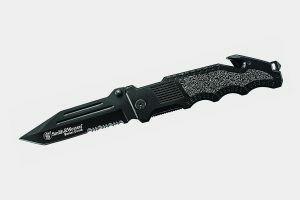 The Mini Auto is a Switchblade tactical knife that is slim and compact but big enough for the professional user. The blade travels extremely fast and once open, it locks securely thanks to a safety button that double locks the blade, open or closed. The 6061-T6 hard-anodized aluminum handle is machined with insets for increased grip and control and houses the partially serrated tanto-style steel blade. The SOG-TAC also features a reversible bayonet style clip so you can carry everywhere your pockets go. At the top end of our guide to, the best tactical knives is the Spyderco Sage Titanium Knife. Honoring renowned knife designer Chris Reeves, the Sage Titanium boasts Reeve’s patented Integral blade locking mechanism. Made of CPM-S30V steel, the flat-ground spear-point blade pays tribute to Spyderco’s Caly3 and Native models in shape and function and the solid titanium scaled handle offers maximum grip during use. A reversible wire pocket clip adjusts for left- or right-hand carry and interior phosphor bronze washers ensure a smooth opening and closing for one-handed blade deployment. Makers of exceptional folding pocket knives, Benchmade’s Contego 810 Knife isn’t designed as a true tactical knife, but in our view is perfectly capable in that role. Built for durability the 810 features the patented AXIS lock that can withstand 800-pounds of pressure without snapping or failing. A carbide tip glass breaker protrudes from the base of the handle, and the textured G-10 scales with easy switch deployment will give you speed when it matters. Although at the top end of our list, the Contego 810 is an affordable tactical knife when you consider the blade is the star of the show. Made from CPM-M4 steel, the blade is rated 62-64HRC and won’t chip, dull, or nick, and holds an ultra-sharp edge even after cutting through bone, wires or hides. 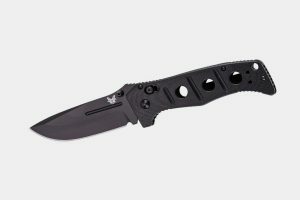 Wrapping up our list of the best tactical knives is another Benchmade knife. One of the largest knives in our guide, the 275 Adamas Tactical Folding Knife is a heavy duty blade rugged enough to handle the toughest field tasks. Benefiting from the excellent AXIS lock (that can withstand 800-pounds of pressure without snapping or failing), the 275 Adamas features large, G-10 scales with full stainless steel liners for enhanced durability and strength. Textured to add grip with bare or gloved hands there is an ambidextrous thumb stud and an attached reversible black steel pocket clip. The drop-point style blade measures 3.82-inches and is made from D2 high carbon, high chrome tool steel with a rating of 60-62 HRC, with excellent edge retention. When a tactical knife isn’t necessary, or even legal, then opt for a great everyday carry knife. Almost as tough, EDC Knives are designed for daily chores and weekend camping trips.